PARspec is the first PAR sensor capable of detecting spectrum, making it suitable for use with any light source including natural light, LED, HPS, fluorescent, and metal halide lighting. PARspec is the first sensor of its kind designed for outdoor and greenhouse use, replacing cumbersome spectroradiometers costing thousands of dollars. PARspec plugs directly into compatible GrowFlux products, making wireless control and monitoring a breeze. Data from PARspec is used to monitor microclimates and PAR levels in controlled environment agriculture; PARspec can also be deployed to control tunable lighting in hybrid lit cultivation facilities. PARspec allows for plug and play Daily Light Integral (DLI) measurement and logging. Photodiode based PAR sensors, also known as quantum sensors, typically detect one band of light across the entire PAR spectrum, providing no data on the spectrum distribution of light and entirely missing light in the far red region. Traditional PAR sensors cannot accurately measure LED grow lights due to the unique spectrum profiles of LEDs. PARspec is a miniature, cost effective spectrometer based PAR sensor which accurately measures spectrum distribution and PAR intensity, and is well suited for measuring all sources of PAR including LED lights and natural light. 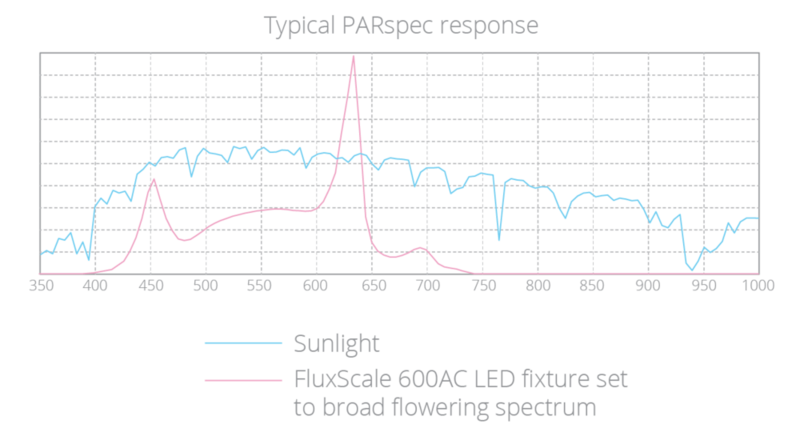 Data from PARspec is used to control tunable LED lights in response to changing natural light throughout the day. PARspec is also used to measure light levels at canopy and within the canopy in indoor cultivation facilities. PARspec plugs into the GrowFlux Sensor Hub with our water resistant push to connect data cable, eliminating wiring and streamlining installation. Data from PARspec is automatically transmitted and logged to your account. PARspec is housed in a rugged hard anodized aluminum housing with a machined PTFE fluropolymer diffusing lens protecting the sensing element. The device is fully waterproof and features a magnetic base to help fix the position of the sensor.